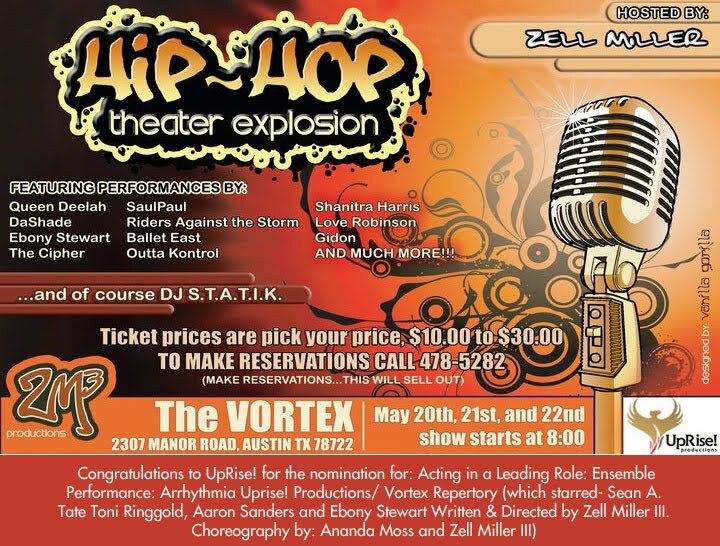 From the glad i went to college department... Hip-Hop Theater Explosion @ The Vortex on May 20th thru 22nd! 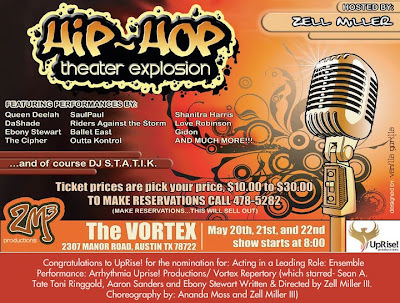 Witness the raw power of write-or-die spoken word artists, street-conscious MCs, unapologetic dancers, acrobatic jam-skaters, and the true essence of The Cipher in Hip Hop Theater Explosion. Hosted by the award-winning Zell Miller III. Music and sound-scape provided by the one and only DJ S.T.A.T.I.K. These Hip-hop super-heroes are bringing it back to the “boom-bap”. Featured Artists: Queen Deelah and DaShade of Black Listed Individuals, The Under 21 Slam Team, The Neo-Soul Slam Team of 2009, Ballet East Dancers, Outta Kontrol, SaulPaul, Riders of the Storm, Love Robinson, Gidon, The Cipher, Visual Impact (jam-skaters), Doc of the Killen Slam Team 2009, Savannah Blue, Ebony Stewart, and many, many more!